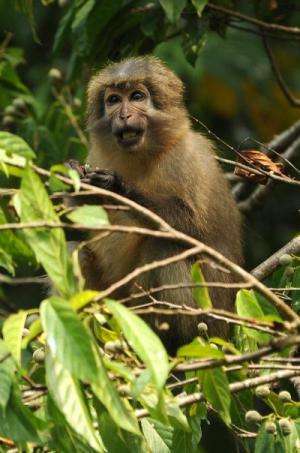 The new study that ranks Tanzania's most threatened primates shows the third most vulnerable is the "endangered" Sanje mangabey, threatened by direct hunting and habitat destruction, especially in unmanaged forests. Credit: Tim Davenport/WCS. A five-year study by the Wildlife Conservation Society gives new hope to some of the world's most endangered primates by establishing a roadmap to protect all 27 species in Tanzania – the most primate-diverse country in mainland Africa. The study assigned a score to pinpoint the most important areas for protection. The analysis revealed more than 60 important primate areas including national parks, game reserves, forest reserves, conservation areas, and currently unprotected landscapes. However, the adequate protection of just nine sites, including six national parks (Kilimanjaro, Kitulo, Mahale, Saadani, Udzungwa and Jozani-Chwaka Bay), one nature reserve (Kilombero) and two forest reserves (Minziro and Mgambo), totaling 8,679 square kilometers (3,350 square miles), would protect all 27 of Tanzania's primate species. The authors say that the Priority Primate Areas could be applied in other nations rich in wildlife but facing burgeoning pressures from population growth. This could be similar to "Important Bird Areas" a global effort to identify and conserve places that are vital to birds and other biodiversity. In fact, Tanzania's Priority Primate Areas were also often rich in bird life underscoring their value to conservation in general. "We believe Priority Primate Areas can be a valuable conservation tool worldwide, similar to the successful Important Bird Area concept," said the study's lead author, Tim Davenport of WCS. "For a developing nation of such global conservation importance like Tanzania, priority setting is an essential tool in managing wildlife." Tanzania is widely regarded as the most important country in mainland Africa for biological diversity and unique species, and contains the continent's highest mountain, deepest lakes and large parts of two globally significant biodiversity hotspots, the Eastern Afromontane and the Albertine Rift. However, Tanzania has the second highest rate of forest loss in sub-Saharan Africa, despite considerable conservation investment and a large amount of land nominally under protection. "This study has global implications as many nations grapple with reconciling their development needs with biological conservation and the needs of wildlife," said James Deutsch, WCS Executive Director for Africa Programs. "Science-based priority setting tools like this one are the best chance for developing nations to minimize biodiversity loss."